Hello, it’s Wednesday and that means it time for some midweek inspiration at From the Heart Stamps (doesn’t seem like 5 minutes that I said that last week!). Today I’m sharing this card that I have made for my brother who’s birthday is next month. This card is going to be from my niece and nephew for their uncle. 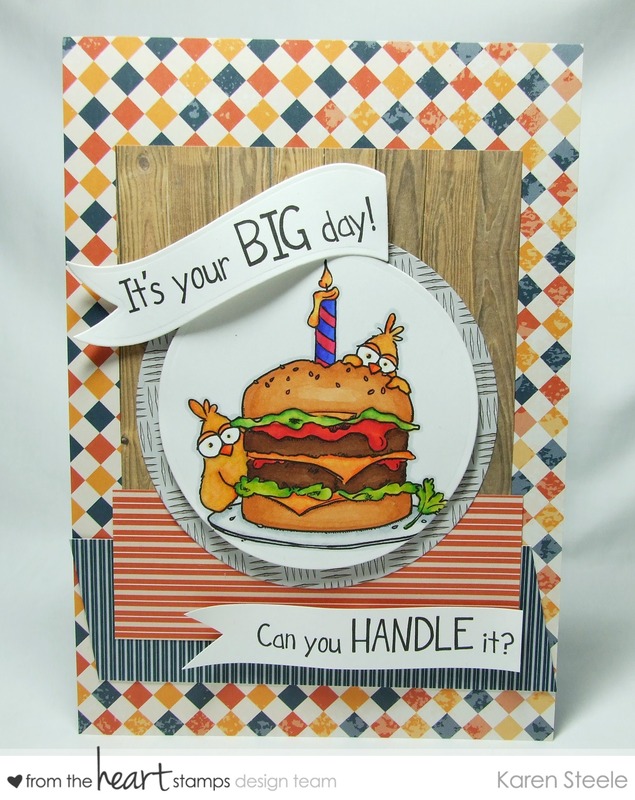 When I started planning Rob’s cards they all involved food – he does love his food! But now I feel pretty bad because he’s since decided to go on a health kick and is now being really good about what he is eating!! In fact he’s lost quite a bit of weight already and he’s only a couple of weeks into it – hmmm, hope his cards don’t tip him over the edge and tempt him to return to his old ways!! Nah, I’m sure he’ll see the funny side – or at least I hope so! 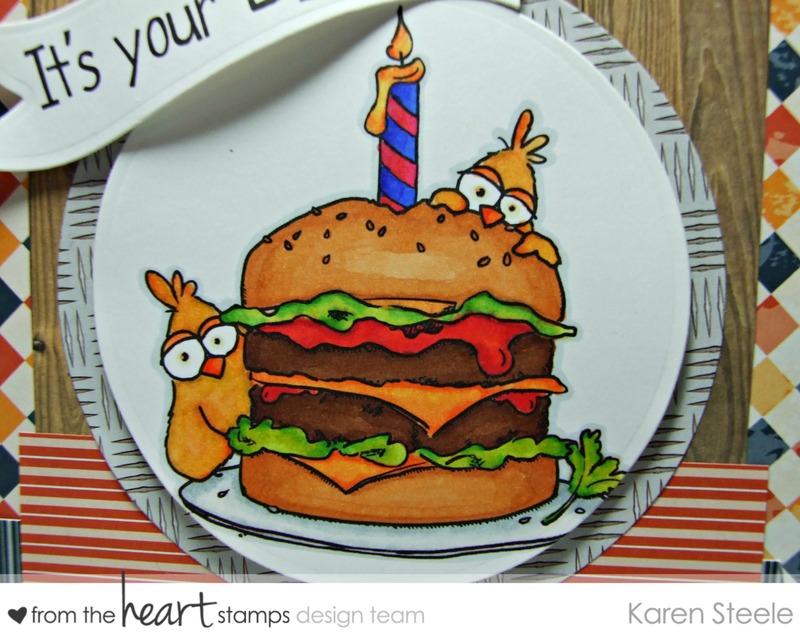 This image is called Birthday Burger Birdbrain and is particularly good for masculine cards I think. I have also followed our weekly Sketch #126 to make this card. Rules about joining in with our I (heart) sketches with a tWiSt challenges can be found HERE. I didn’t use the ‘twist’ this week and just stuck to the sketch. Why not join in with the challenge? Everyone who enters will receive a $1 credit to the store which you can save for an image or you could get one of the many $1 images in store right now – everyone’s a winner! All you need to do is use a From the Heart image and you’re good to go! I have also used papers from Papermania – Mr Mister, Spellbinders Circle and Banner Dies, Kaisercraft Rectangle Die and Spectrum Noirs to colour. Hey Karen, this is a fun card for your brother, he’s sure to love it! Loving the masculine papers too. LOL! This is so cute, Karen!!! I love the sentiment and your coloring is beautiful! Adorable card Karen – He is going to love it! Fun papers and the banners are a great touch! my hubby would love this! love this card!